Tryparedoxin peroxidase (TXNPx) participates in defence against oxidative stress as an antioxidant by metabolizing hydrogen peroxide into water molecules. Reports suggest that drug-resistant parasites may increase the levels of TXNPx and other enzymes, thereby protecting them against oxidative stress. In this study, the gene encoding cytosolic TXNPx (cTXNPx) was characterized in lines of Leishmania (Viannia) braziliensis and Leishmania (Leishmania) infantum that are susceptible and resistant to potassium antimony tartrate (Sb(III)). We investigated the levels of mRNA and genomic organization of the cTXNPx gene. In addition, we transfected the Leishmania lines with the cTXNPx gene and analysed the susceptibility of transfected parasites to Sb(III) and to hydrogen peroxide (H2O2). Northern blot and real-time reverse transcriptase polymerase chain reaction analyses revealed that the level of TXNPx mRNA was approximately 2.5-fold higher in the Sb(III)-resistant L. braziliensis line than in the parental line. In contrast, no significant difference in cTXNPx mRNA levels between the L. infantum lines was observed. Southern blot analyses revealed that the cTXNPx gene is not amplified in the genome of the Sb(III)-resistant Leishmania lines analysed. Functional analysis of cTXNPx was performed to determine whether overexpression of the enzyme in L. braziliensis and L. infantum lines would change their susceptibility to Sb(III). Western blotting analysis showed that the level of cTXNPx was 2 to 4-fold higher in transfected clones compared to non-transfected cells. Antimony susceptibility test (EC50 assay) revealed that L. braziliensis lines overexpressing cTXNPx had a 2-fold increase in resistance to Sb(III) when compared to the untransfected parental line. In addition, these clones are more tolerant to exogenous H2O2 than the untransfected parental line. In contrast, no difference in Sb(III) susceptibility and a moderate index of resistance to H2O2 was observed in L. infantum clones overexpressing cTXNPx. Our functional analysis revealed that cTXNPx is involved in the antimony-resistance phenotype in L. braziliensis. Leishmaniasis refers to a spectrum of diseases caused by different species of protozoan parasites belonging to the genus Leishmania. An estimated 12 million people are infected with Leishmania parasites and an additional 350 million people are at risk worldwide . The clinical manifestation of the disease depends on genetic factors, the host immune system, and mainly on the parasite species involved . In the New World, L. (Leishmania) infantum (syn. L. (L.) chagasi)  is the causative agent of visceral leishmaniasis, whereas L. (V.) braziliensis causes cutaneous and mucocutaneous leishmaniasis . The control of leishmaniasis relies primarily on chemotherapy. The pentavalent antimony-containing compounds (sodium stibogluconate- Pentostam® and N-methyl-glucamine- Glucantime®) have been the first-line drugs for treatment of all forms of the disease for more than 70 years . The mechanism of action of antimony has not been fully elucidated. Studies suggest that Sb(V) inhibits macromolecular biosynthesis in amastigotes, possibly altering energy metabolism by inhibiting glycolysis and the oxidative pathway of fatty acids [5, 6]. Sb(III) is purported to generate disturbances in the thiol redox potential of the parasite by inducing the efflux of intracellular thiols and by inhibiting trypanothione reductase, resulting in cell death by oxidative stress . The drugs used against leishmaniasis have several drawbacks, including toxic side effects, high cost, and the occurrence of antimony-resistant Leishmania strains . The resistance to pentavalent antimonials has reached epidemic proportions in Bihar (India), where more than 60% of patients with visceral leishmaniasis were unresponsive to Sb(V) treatment . Even though the mechanism of antimony-resistance in Leishmania spp. has been widely studied, many questions remain unanswered . It has been described that resistance involves interplay between uptake, efflux, and sequestration of active molecules [8, 10]. Most parasites, including Leishmania spp., are more susceptible to reactive oxygen species than their hosts [8, 11]. To prevent cell damage due to reactive oxygen species (ROS), organisms have developed different antioxidant defence systems . In trypanosomatids, peroxidases display a unique feature in using reducing equivalents derived from trypanothione, a dithiol found exclusively in these protozoa, in contrast to other eukaryotes that utilize glutathione and catalase [13, 14]. The function of these antioxidant enzymes include defence against chemical and oxidative stress, by catalyzing the reduction of hydrogen peroxide and small-chain organic hydroperoxides to water and alcohol, respectively. The combined action of trypanothione reductase, tryparedoxin, and tryparedoxin peroxidase is central to the maintenance of a low concentration of hydrogen peroxide (H2O2) . Tryparedoxin peroxidase (TXNPx) belongs to the 2-cysteine peroxiredoxin family, and can be grouped according to its compartmentalization to the cytosol or mitochondria . These enzymes are highly conserved and they are present in various Leishmania species [15–17]. Recently, our proteomic analyses have revealed that cytosolic TXNPx (cTXNPx) is overexpressed in antimony-resistant L. braziliensis and L. infantum lines . However, its role in the Sb(III)-resistance phenotype in these Leishmania species had not been elucidated. Thus, the aim of the present study was to characterize TXNPx in these lines by assessing mRNA levels and genomic organization. In addition, functional analysis of cTXNPx was performed to determine whether its overexpression in Leishmania lines would change the susceptibility of the parasites to antimony (Sb(III)) and hydrogen peroxide (H2O2). Promastigote forms of L. (Viannia) braziliensis (MHOM/BR/75/M2904) and L. (Leishmania) infantum (syn. L. (L.) chagasi) (MHOM/BR/74/PP75) were used in this study. Sb(III)-resistant lines were previously obtained from wild-type L. braziliensis and L. infantum lines by stepwise increasing the drug pressure with Sb(III) . These resistant lines are 20 and 4-fold less sensitive to SbIII than their respective parental counterparts . Promastigote forms of these Leishmania lines were grown in M199 medium, harvested in the logarithmic growth phase, washed in PBS and the parasite pellets were used for DNA, RNA and protein preparations. Total RNA and genomic DNA from Leishmania lines were extracted as previously described . Southern and northern blots were carried out using a protocol previously described . Probes for both assays were prepared by amplification of a 592 bp fragment of cTXNPx gene from L. braziliensis (TritrypDB accession no. Lbr15.1080) using specific primers (forward primer: 5′-CGGTGACGCCAAAATGAAC- 3′; reverse primer: 5′- CTACACCGTGCTGAAGTAGC- 3′). The corresponding fragment has 87.4% nucleotide sequence identify with the cTXNPx gene from L. infantum. The PCR product was labelled with [α-32P] dCTP using Nick Translation Kit (Invitrogen, Carlsbald, CA) following the manufacturer’s instructions. Blots were hybridized with a 32P-labelled cTXNPx-specific probe, according to Murta et al. . Band intensities were analyzed using the software CP ATLAS 2.0 (http://lazarsoftware.com/download.html). The protocol employed for the preparation of first strand cDNA and the procedure for real time RT-PCR were as previously described . cDNA was used for RT-qPCR amplification on an ABI Prism 7500 - Sequence Detection System (PE Applied Biosystems, Foster City, CA, U.S.A.). The specific primers (forward primer: 5′ CGGTGACGCCAAAATGAAC 3′; reverse primer 5′- GAAGTCAAGCGGGTAGAAGAAGAG- 3′) employed were designed from the complete nucleotide sequence of the cTXNPx gene (Lbr15.1080). The 18S small subunit ribosomal RNA (18S SSU rRNA) constitutive gene from Leishmania was used to normalize the amount of sample analyzed. The primers (forward primer: 5′- TCTAGGCTACCGTTTCGGCTT-3′; reverse primer: 5′-CACACACCGAACCGAAGTTG-3′) were designed from the complete nucleotide sequence of the 18S SSU rRNA gene (LmjF.27.rRNA.01). Both pair of primers amplified fragments of 136 bp and 97 bp respectively, in all Leishmania lines (data not shown). Standard curves were prepared for each run using known quantities of pCR 2.1-TOPO plasmids (Invitrogen) containing the cTXNPx and 18S SSU rRNA genes. Estimates of transcript levels were obtained using the Sequence Detection System data analysis software. Values were normalized to those obtained for 18S SSU rRNA for each sample. A 600 bp fragment corresponding to L. braziliensis cTXNPx ORF (TritrypDB accession number LbrM15.1080) was amplified with Pfx DNA polymerase (Invitrogen) from L. braziliensis genomic DNA using the forward primer: 5′-tAGATCT ccaccATGTCCTGCGGTGACGCCAA-3′ and the reverse primer: 5′-ttAGATCT CTACACCGTGCTGAAGTAGC-3′ in which the italicized sequences correspond to BgI II restriction site. The obtained PCR product was cloned into the pGEMT-easy vector (Invitrogen) and subsequently submitted on an ABI 3130 (Applied Biosystems, Foster City, CA, USA) for confirmation of correct sequence. The pGEM-LbcTXNPX construct was restricted with Bgl II and the released fragment was subcloned into the dephosphorylated pIR1-BSD expression vector, generously provided by Dr. Stephen Beverley (Washington University in St. Louis – USA). To confirm correct direction of cloning, the construct was then digested with Bam HI releasing fragments that confirmed the sense direction of gene. Thereafter, the constructs pIR1-BSD (empty vector) and pIR1-BSD-Lb cTXNPx were linearized by Swa I digestion and electroporated into L. braziliensis and L. infantum wild type lines using a GenePulser XCell (BioRad, Hercules, CA, USA). This allowed integration of the vector into the ribosomal small subunit locus . Colonies were obtained following plating on semisolid M199 medium containing Blasticidin (BSD) (10 μg/ml), after 1–2 weeks. Clonal lines were generated and the presence of construct was confirmed by PCR tests using genomic DNA with specific primers for the BSD marker. In order to investigate the cTXNPx levels of transfected lines, Western blot assays were carried out. Total protein from the different Leishmania clonal lines were extracted according to the protocol described by Gamarro et al.. Proteins extracts (20 μg) were separated by electrophoresis on a 12% SDS polyacrylamide gel and electrotransferred onto nitrocellulose membrane (Bio-Rad). The membrane was blocked by incubation with 5% instant non-fat dry milk in PBS supplemented with 0.05% Tween 20 (PBS-T) for 1 h. The membrane was then washed twice in PBS-T for 5 min and incubated for 16 h at 4°C in the blocking solution with a polyclonal rabbit anti-T. cruzi TXNPx antibody (1:500)  (kindly provided by Dr. Fernanda Nogueira, CPqRR, Belo Horizonte, Brazil). The blots were washed three times in PBS-T and then incubated for 1 h with alkaline phosphatase-conjugated anti-rabbit IgG (Invitrogen) diluted 1:6.000 in blocking solution. Subsequently, the blots were developed using a colorimetric method (Bio-Rad) following the manufacturer’s instructions. The blots were normalized using a monoclonal anti-α-tubulin antibody (1:10.000) (Sigma, St. Louis, USA). The intensity of the bands was analyzed using the software CP ATLAS 2.0. Promastigotes of wild-type L. braziliensis and L. infantum transfected or non-transfected with the constructs pIR1-BSD (empty vector) or pIR1-BSD-LbcTXNPx were submitted to Sb(III) and hydrogen peroxide (H2O2) susceptibility tests. Parasites were incubated in M199 medium at 2 × 106 cells ml−1 in 24-well plates in the absence or presence of various concentrations of SbIII (0.0125 to 1 mg/ml) or H2O2 (200 to 600 μM) for 48 hours. The concentration of Sb(III) or H2O2 required to inhibit the growth by 50% (EC50) was determined using a Z1 Coulter Counter (Beckman Coulter, Fullerton, CA, USA). EC50 values were determined from three independent measurements, each performed in triplicate, using the linear interpolation method . All experiments were performed at least three times and data have been represented as mean ± standard deviation. Data were analyzed by Student’s t test performed using the software GraphPad Prism 5.0. A p value of less than 0.05 was considered statistically significant. Genomic organization of the cTXNPx gene in Sb(III)-resistant and -susceptible lines of L. braziliensis and L. infantum was determined by Southern blot analysis of parasite DNA digested with an endonuclease (Eco RI or Bam HI). Hybridization of the blots with an LbcTXNPx gene specific probe revealed that Eco RI-digested DNA gave a major band of 14.0 kb for both L. braziliensis lines, and bands of 0.6, 0.8, 4.0, and 14.0 kb for L. infantum lines (Additional file 1: Figure S1). Upon hybridization, Bam HI-digested DNA from L. braziliensis lines identified a single 12 kb band, while lines from L. infantum contained bands of 0.5, 0.6, and 12 kb (Additional file 1: Figure S1). Others bands having a low intensity were also observed. We observed a polymorphism in the cTXNPx sequence between both Leishmania species analysed. Comparative densitometry of the bands showed no amplification of cTXNPx gene in both Sb(III)-resistant Leishmania lines. The levels of cTXNPx mRNA across different parasite lines were evaluated by Northern blot. A transcript of 0.5 kb was detected in Northern blots from Sb(III)-susceptible and -resistant L. braziliensis and L. infantum lines following hybridization with a 32P-labelled cytosolic tryparedoxin peroxidase from L. braziliensis (LbcTXNPx) gene specific probe (Figure 1A). Loading controls using a ribosomal RNA probe are shown in Figure 1B. Densitometry of the transcript profiles revealed that the cTXNPx mRNA level was 2.5-fold higher in the Sb(III)-resistant L. braziliensis line when compared to the parental line (Figure 1C). No difference in the levels of cTXNPx mRNA was detected in both Sb(III)-resistant and -susceptible L. infantum lines. Levels of cTXNPx gene transcript in Sb(III)-susceptible and Sb(III)-resistant L. braziliensis and L. infantum lines. (A) Northern blot analysis of total RNA (20 μg) from Leishmania spp. lines separated on a 1.2% agarose gel and transferred to nylon membranes. Blots were hybridized with a 32P-labelled cTXNPx-specific probe. (B) As a control, the same nylon membrane was hybridized with a 32P-labelled 24S rRNA-specific probe. (C) Quantification of bands was done by densitometric analysis using the software CP ATLAS 2.0. (D) Levels of cTXNPx mRNA of L. braziliensis and L. infantum lines determined quantitatively (relative to the 18S small subunit ribosomal RNA -18S SSU rRNA) by real-time PCR. Mean values of the transcript levels of cTXNPx/SSU ± standard deviations as determined from three independent experiments are shown. Statistically different values are indicated as follows: *p < 0.04, **p < 0.0002.
cTXNPx mRNA levels were determined with greater precision by RT-qPCR. The amount of cTXNPx cDNA and 18S SSU rRNA in different Leishmania lines was determined by linear regression analysis using the PCR threshold cycle (CT) values obtained from the standard curve generated with known amounts of the plasmids containing these genes. The amount of cTXNPx cDNA in each line was normalized to the reference housekeeping gene, 18S SSU rRNA (LmjF.27.rRNA.01). The results confirmed the northern blot data, demonstrating that the level of cTXNPx gene transcripts was 2.5-fold higher in the Sb(III)-resistant L. braziliensis line when compared to the parental line. In addition, no difference was detected between the lines of L. infantum analysed (Figure 1D). We transfected wild-type L. braziliensis and L. infantum lines with the construct pIR1-BSD-LbcTXNPx to generate transfectants overexpressing cTXNPx. Linearization of the vector allowed integration of the construct into the ribosomal small subunit locus, by homologous recombination . The successful integration of constructs was confirmed by PCR, using genomic DNA as template and with specific primers for the Blasticidin (BSD) marker. About 24 clones each for pIR1-BSD (empty vector) and pIR1-BSD-LbcTXNPX from L. braziliensis and L. infantum lines were analysed by PCR. It was observed that all blasticidin-resistant clones produced a fragment of 399 bp, indicative for the BSD marker (data not shown). These clones were subjected to Western blotting analysis to evaluate the level of cTXNPX. The anti-T. cruzi TXNPX antibody  recognized a 23 kDa band in all Leishmania clones (Figure 2A). Densitometry of the cTXNPx band using an anti-α tubulin antibody as reference (Figure 2B) showed that the level of cTXNPx was 2 to 4-fold higher in the transfected clones from both L. braziliensis and L. infantum lines when compared to the untransfected controls (Figure 2C). cTXNPx expression levels in clonal lines from L. braziliensis and L. infantum untransfected or transfected with constructs pIR1-BSD/pIR1-BSD-LbcTXNPx. Total protein (20 μg) was separated on a 12% SDS polyacrylamide gel and blotted onto nitrocellulose membranes. The blots were probed with a polyclonal rabbit anti-T. cruzi cTXNPx antibody (1:500) (A) and with a monoclonal anti-α-tubulin antibody (1:10.000) (B) and developed with NBT/BCIP. (C) Quantification of bands was done by densitometric analysis using the software CP ATLAS 2.0. Statistically different values are indicated as follows: *p < 0.003. In order to investigate whether overexpression of cTXNPx gene favours an antimony-resistance phenotype, clonal lines from L. braziliensis and L. infantum transfected with the constructs pIR1-BSD (empty vector) or pIR1-BSD-LbcTXNPx and untransfected parasites were subject to a Sb(III) susceptibility test. As shown in Figure 3A, with increasing concentrations of Sb(III) there was a rapid decline in the percentage of live parasites in both untransfected and empty vector transfected L. braziliensis lines when compared to cTXNPx overexpressing lines. The concentration of Sb(III) required to inhibit the growth of the parasites by 50% (effective concentration- EC50) was 0.03 mg/ml for both controls. In contrast, cTXNPx overexpressing lines were 2.3-fold more resistant to Sb(III), with an EC50 of 0.07 mg/ml. Interestingly, L. infantum cTXNPx overexpressing lines did not show an increase in resistance towards Sb(III). The cTXNPx overexpressing lines had an EC50 value (0.11 mg/ml) similar to that of the controls (0.12 mg/ml) (Figure 3B). 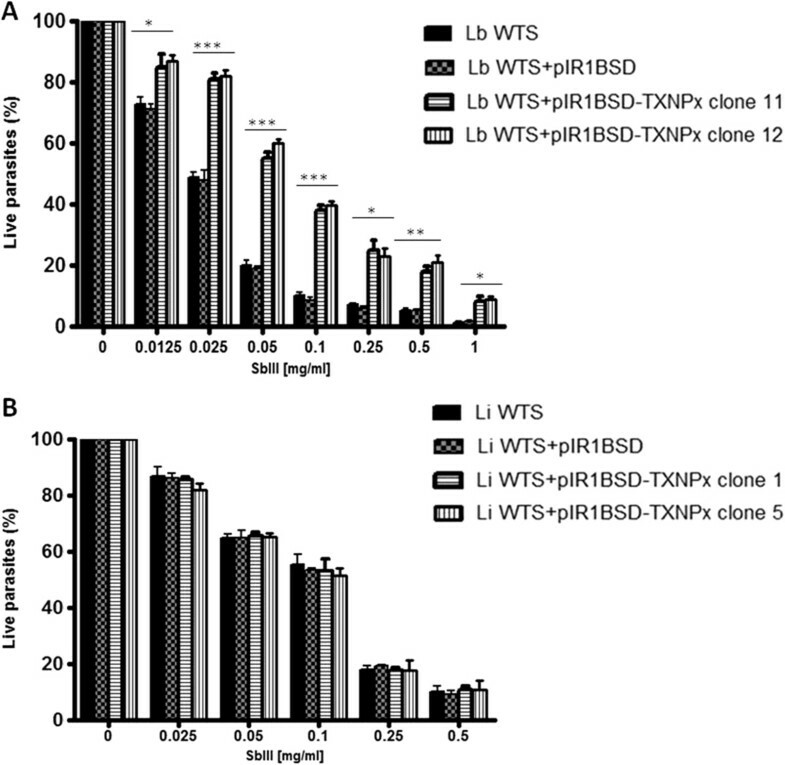 Sb(III) susceptibility of clonal lines from L. braziliensis (A) and L. infantum (B) untransfected or transfected with constructs pIR1-BSD or pIR1-BSD-LbcTXNPx. Parasites were incubated in M199 medium in the absence or presence of various concentrations of Sb(III) (0.0125 to 1 mg/ml) for 48 hours and the percentages of live parasites were determined using a Z1 Coulter Counter. Mean values ± standard deviations from three independent experiments in triplicate are shown. Statistically different values are indicated as follows: *p < 0.04, **p < 0.007 and ***p < 0.002. The tolerance to oxidative stress generated by increased concentrations of hydrogen peroxide was evaluated in the cTXNPx overexpressing lines of L. braziliensis and L. infantum (Figure 4). In vitro assays revealed that the cTXNPx overexpressing LbWTS clones 11 and 12 displayed an EC50 value towards H2O2 of 408 and 400 μM, respectively (Figure 4A). In contrast, untransfected and empty vector transfected lines exhibited lower EC50 values for H2O2 (260 and 256 μM, respectively). Thus, cTXNPx overexpressing lines were 1.56-fold (p < 0.001) more tolerant to exogenous hydrogen peroxide than controls in L. braziliensis. A moderate index of resistance to H2O2 was observed for the cTXNPx overexpressing lines of L. infantum compared to that of L. braziliensis. LiWTS clones 1 and 5 displayed EC50 values of 456 and 450 μM, respectively towards H2O2 (Figure 4B). In contrast, untransfected and empty vector transfected lines exhibited lower EC50 values for H2O2 (373 and 368 μM, respectively). Thus, cTXNPx overexpressing lines were 1.22-fold (p < 0.001) more tolerant to exogenous hydrogen peroxide than controls in L. infantum. In vitro tolerance of L. braziliensis (A) and L. infantum (B) lines untransfected or transfected with constructs pIR1-BSD/pIR1BSD-cTXNPx, to exogenous hydrogen peroxide. Parasites were cultured for 48 h in the presence of different concentrations of hydrogen peroxide and the percentages of live parasites were determined using a Z1 Coulter Counter. Mean values ± standard deviations from three independent experiments in triplicate are shown. Statistically different values are indicated as follows: *p < 0.04, **p < 0.005 and ***p < 0.0001. Antioxidant defence is a promising target for chemotherapy against trypanosomatids, since these organisms present a unique mechanism for detoxification of peroxides that is dependent on trypanothione, which differs from the glutathione-based system found in vertebrates. In trypanosomatids, TXNPx participates in defence against oxidative stress by metabolizing hydrogen peroxide into water molecules . This enzyme is critical to the survival of Leishmania during oxidative stress generated by macrophages and by drugs . In previous studies carried out by our group, using proteomic analysis it was indicated that seven protein spots corresponding to TXNPx were 2 to 5-fold more abundant in the Sb(III)-resistant lines of both L. braziliensis and L. infantum species than in their Sb(III)-susceptible parental lines . In the present work, we have extended these results by characterizing cTXNPx in Sb(III)-susceptible and -resistant L. braziliensis and L. infantum lines and by performing functional analysis of this enzyme. Our results demonstrated that in the Sb(III)-resistant L. braziliensis line the increase in cTXNPx mRNA levels (2.5-fold) is correlated with high cTXNPx protein levels (3-fold; Matrangolo et al. ). In contrast, no difference in the transcription level of this gene was found for Sb(III)-resistant and -susceptible L. infantum lines. However, Matrangolo et al. showed that the cTXNPx protein level was 1.6-fold higher in the Sb(III)-resistant L. infantum lines when compared with Sb(III)-susceptible parental lines. 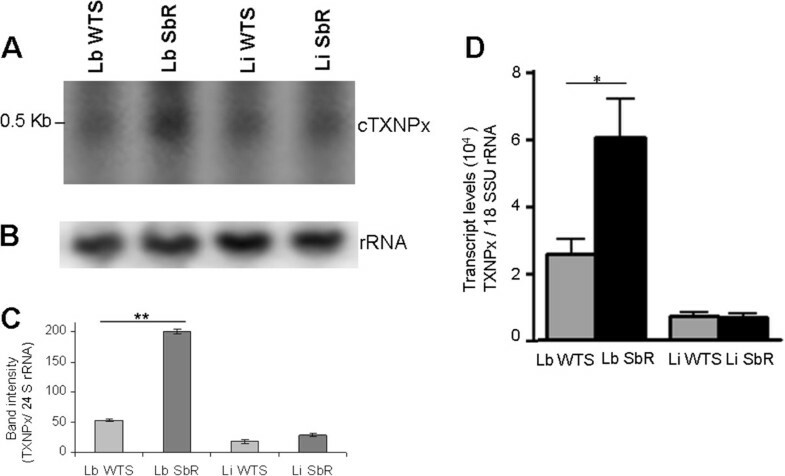 Since gene expression in trypanosomatids is regulated mainly at the post-transcription level , our results suggest that the higher levels of cTXNPx protein detected in the Sb(III)-resistant L. infantum (LiSbR) line maybe related to an increased stability of mRNA or more efficient protein translation when compared with the wild-type L. infantum (LiWTS) pair. Altogether, these findings are in agreement with existing data reporting an increase in TXNPx mRNA and TXNPx protein levels in drug-resistant parasites. Nogueira et al. demonstrated an increased expression of TXNPx transcript and TXNPx protein in T. cruzi resistant to benznidazole. Metronidazole-resistant Entamoeba histolytica showed a 3-fold increase in its TXNPx mRNA levels . In an Sb(III)-resistant L. tarentolae line, an increase of cytosolic (6.5-fold) and mitochondrial (1.8-fold) TXNPx enzymes has been reported . Protein analyses indicated high levels of TXNPx in antimony-resistant L. donovani lines  and gentamicin-resistant L. infantum clones . In order to investigate the role of cTXNPx in protecting the parasite against oxidative stress and its involvement in Sb(III)-resistance, this enzyme was overexpressed in L. braziliensis and L. infantum promastigotes. Interestingly, clones from L. braziliensis that overexpress the cTXNPx were 2-fold more resistant to Sb(III). This result indicates that the enzyme is involved in the Sb(III)-resistance phenotype probably along with other enzymes, since the drug resistance phenotype is known to be multifactorial and multigenic. TXNPx is a key antioxidant enzyme important for parasite resistance to oxidative stress. Previous studies have demonstrated that Sb(III) perturbs the thiol redox potential of the parasite, leading to accumulation of reactive oxygen species (ROS) [7, 33]. Sb(III) forms a complex with either trypanothione or glutathione that can be sequestrated in an intracellular compartment or directly excreted from parasites in response to SbIII treatment [7, 8]. Thus, Sb(III) decreases intracellular thiol buffer capacity, and it also increases the intracellular concentration of the disulfide forms of these thiols through inhibition of trypanothione reductase . These effects of Sb(III) favour increased levels of ROS. 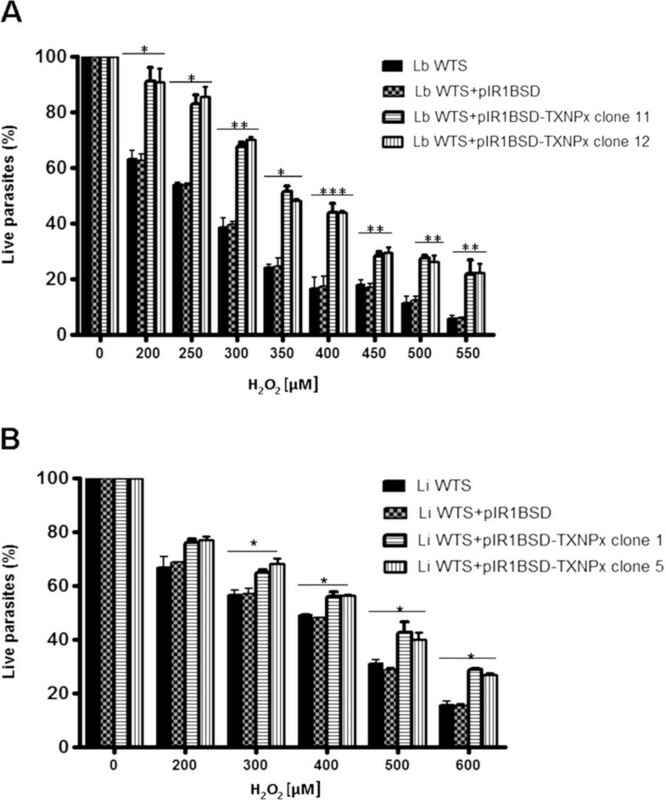 Overexpression of TXPNx confers resistance to Sb(III) by an increased enzyme activity that acts to reduce levels of ROS induced by exposure to Sb(III). Data from literature reinforce our results in L. braziliensis, since overexpression of TXNPx in L. tarentolae caused a significant increase in resistance to Sb(III) . In contrast, overexpression of an enzymatically inactive TXNPx failed to result in resistance to Sb(III) . These data suggest that the mechanism of TXNPx-dependent resistance is likely due to enhanced antioxidant activity. Reports have shown that parasites overexpressing cTXNPx exhibit a high level of resistance to reactive oxygen radicals. In T. cruzi, it has been reported that overexpression of TXNPx protects the parasite from H2O2 and organic peroxide t-butyl hydroperoxide damage [34, 35]. Lyer et al. observed an increase in the cTXNPx levels in L. donovani after exposure to H2O2. Additionally, the authors also demonstrate that L. donovani parasites transfected with cTXNPx are more resistant to antimony and exhibit an increase in virulence when compared to parental parasites. All these data are in agreement with our results showing that cTXNPX overerexpressing L. braziliensis and L. infantum clones are more tolerant to exogenous H2O2 than an untransfected parental line. However, the L. infantum clones present a moderate index of tolerance to H2O2 when compared to L. braziliensis. This difference could explain, at least in part, the absence of resistance to Sb(III) in these clones, since our results show that overexpression of this enzyme has no direct involvement in the Sb(III)-resistance in L. infantum. In addition, the absence of Sb(III) resistance in cTXNPx overerexpressing L. infantum could also be due to differences in antimony-resistance mechanisms between these two Leishmania species. Moreira et al. demonstrated that an Sb(III)-resistant L. braziliensis line presented an increased expression of the MRPA gene product and a reduction in the accumulation of antimony. However, no difference was detected between the Sb(III)-resistant and susceptible L. infantum lines. The results of the functional analysis revealed that cTXNPx is involved in the antimony-resistance phenotype in L. braziliensis. However, in L. infantum, this enzyme does not seem to be directly associated with resistance to Sb(III). Interestingly, Wyllie et al. have reported elevated levels of TXNPx in antimony-unresponsive L. donovani field isolates. These data suggest that increased expression of this enzyme may play an important role in clinical resistance to antimony. 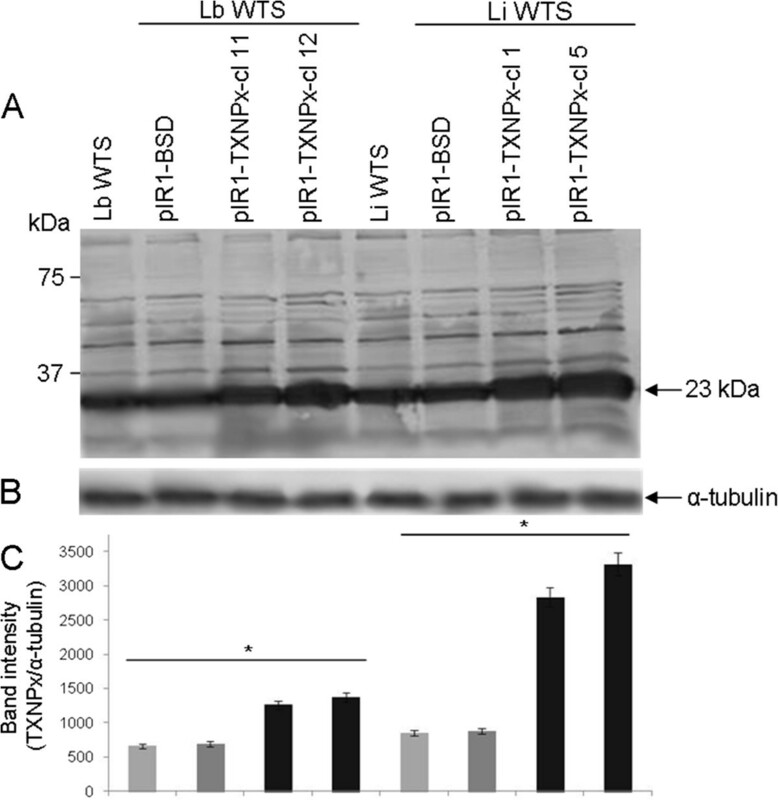 The authors wish to thank Dr. Stephen Beverley and Dr. Fernanda Nogueira for kindling provided the pIR1-BSD vector and the polyclonal antibody anti-tryparedoxin peroxidase, respectively and M.Sc. Nayara G. Tessarollo for her assistance in Southern blot assays. We also thank the Program for Technological Development in Tools for Health-PDTIS-FIOCRUZ for use of its facilities. This investigation received financial support from the following agencies: Conselho Nacional de Desenvolvimento Científico e Tecnológico (CNPq/Universal 475782/2012-7), Fundação de Amparo à Pesquisa do Estado de Minas Gerais (FAPEMIG – CBB-PPM 00536/11 and CBB - PPM-00196-13), Coordenação de Aperfeiçoamento de Pessoal de Nível Superior (CAPES), UNICEF/UNDP/World Bank/WHO - TDR and P3D-Programa de descoberta e desenvolvimento de drogas (PROEP/CNPq/FIOCRUZ 401988/2012-0). S.M.F. Murta is a research fellow supported by CNPq (National Council for the Development of Research of Brazil) and J.M. Andrade by CAPES (06563529658/2012). Conceived, designed the experiments, performed the experiments, analyzed the data and helped to draft the manuscript: JMA and SMFM. Both authors read and approved the final manuscript.